The holidays are upon us—good cheer, warm cockles, and dining while captive audience to your white supremacist uncle. I’m not promising boozy ice cream will take the edge off. But it can’t hurt. Spirit flavors are well trodden territory. If you can find it in a bottle, or make it in a still out back, someone’s probably made ice cream with it. I’ve made—or tried or seen or heard rumors of—ice creams made from every cordial and liqueur, malted and distilled grain, wine from every fruit (fortified in every kind of barrel), stout and ale and lambic and mead, brandy, sake, kefir, and all forms of home-grown something steeped in home-brewed something else. The new frontiers seem to be about reimagining classic (or transgressive) cocktails as ice cream flavors. More on this later. Just about the only booze I’ll recommend against is vodka, or other “neutral” spirits like Everclear. These are neutral in the sense that most of the character of the original fermented ingredient has been distilled and filtered out, and no new flavors have been added. These liquors all taste different straight up, but the subtleties are masked by any cocktail, and certainly by anything full of sugar and cream. All they add to ice cream is problems. And alcohol indeed presents some problems. As a tiny molecule with a low molecular weight, ethanol (the alcohol that we choose to drink, because it’s non-toxic, more or less) has high powers of freezing point depression. (Please see the post on Sugars for a review freezing point depression in ice cream). By weight, alcohol depresses the freezing point more than any sugar (over seven times more than table sugar), or any other ingredient we’ll likely use. This is why liquor-flavored ice creams are often soft, and often melt almost instantly on the plate. We handle this by reducing other ingredients that have high freezing point depression. Additionally, we may have to limit the amount of alcohol. You can limit the alcohol either by reducing the quantity of spirits, or by simmering a portion of it to remove much of the alcohol, while concentrating the less volatile flavors. I find the latter method helpful with milder flavored liquors, like Cognac, or with alcoholically weaker ones, like wine and beer (which need water, rather than alcohol, boiled off). In many other cases, the boozy ingredient has more than enough flavor even in modest quantities, so the amount that tastes good presents a manageable amount of alcohol. In all cases, it’s helpful to reduce other ingredients with high freezing point depression. The first step is to simply eliminate the dextrose. It has double the depression of table sugar (sucrose), and is about a third less sweet. You may wish to increase the table sugar a bit to compensate. If the spirit you’re using is sweet, this may be unnecessary. Keep an open mind to making your ice creams much less sweet than what’s typical; you may find that they just taste better all around—less cloying, with more dimensions and subtleties to the flavors. You may wish to reduce the invert syrup a bit. And it’s often helpful to slightly increase the stabilizers. I find that just increasing the locust bean gum 20-25% is all that’s necessary, and that it helps without causing any textural weirdness. 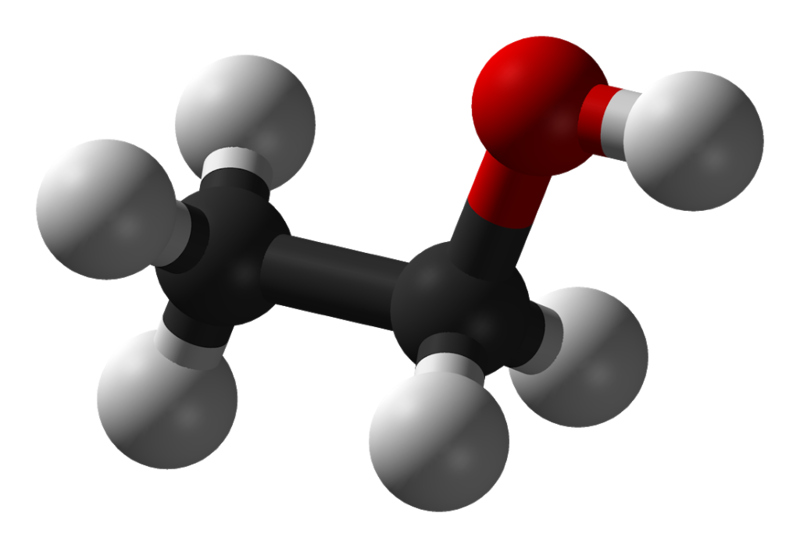 The wee ethanol molecule. Molecular weight 46g/mol. Looks like a Jeff Koons sculpture, but bites. These are suggested maximum quantities. In many cases, you’ll choose to use less. If you’re using liquors that have lighter flavors relative to the alcohol content (cognac, sake, grappa) you may wish to to use more, but to simmer off the alcohol from a portion of it. For example, with cognac ice cream, I simmer 115g of cognac until it’s reduced by about 2/3. At this point most of the alcohol is gone. I add this along with 30g unreduced cognac. For weaker spirits, like wine, the problem isn’t the added alcohol as much as the added water. You can reduce a portion of the wine with heat, but not most of it; heat will kill the aromatic flavors. I find it best to replace a portion of the milk with the wine—then add a commensurate amount of nonfat dry milk, to make up for the lost solids. Ultra boozy ice cream is becoming a trend, with companies like Tipsy Scoop churning out 5% alcohol concoctions. When you get into this range, it’s more about a sweet frozen cocktail than about a liquor-flavored ice cream. 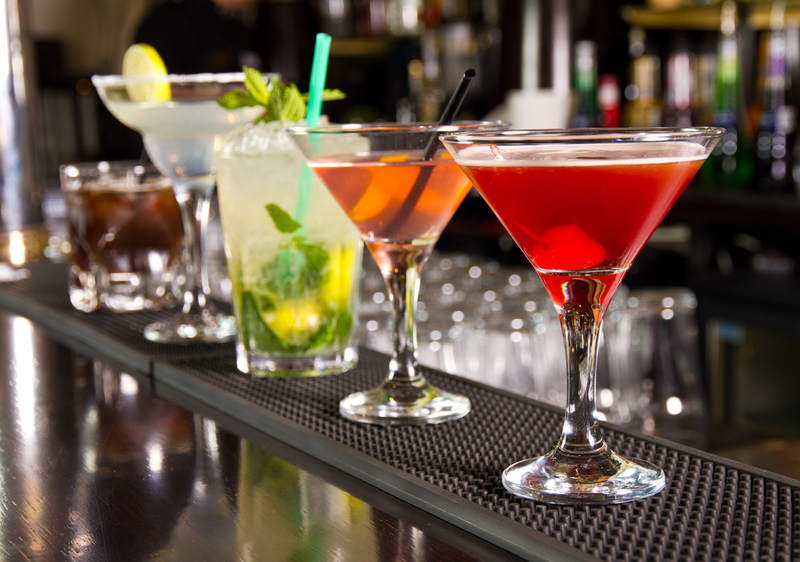 Getting you buzzed takes a higher priority than texture or flavor. And you have to start carding people. If you want to head in this direction, just follow the instruction here, but take everything farther. My general rule is to use liquor that you’d happily use in a sweet, tropical cocktail. Not necessarily the finest (you’re not going to taste all the subtleties through the dairy and sugar). But go for full flavors, and nothing that tastes bad. For example, with cognac, I use an affordable VSOP grade that I’d be happy to drink, but that I wouldn’t be tempted to ruminate over with my pompous friends. I like Gosling’s rum—bold, full-flavored, if not the most complex. Save the really good / delicate stuff for drinking straight. Of course, some varieties of liquor are proprietary, and if you want their flavor profile you have to buy their brand. Like Campari, or Grand Marnier (see below). Some of these are going to cost you. -If booze is a liqueur with added sugar, take into consideration. You may actually be able to reduce sucrose or keep it the same. -increase Locust Bean Gum up to 25%, depending on total quantity of added alcohol and water. Beer flavors (consider stouts and lambics!) would probably benefit from similar treatment (but beware IPAs and other hoppy brews—the bitterness does not boil off and will concentrate if you make a reduction). If you experiment with this template, please let me know how it goes. In some cases you can stick pretty close to the cocktail recipe. In others, you might find that some ingredients add too much alcohol relative to their flavor. Gin, for example. High alcohol content, subtle flavors. And many of the flavors are aromatic, so you risk losing them if you reduce over heat. Assuming you don’t have a rotary evaporator, one solution is to add your own flavors through infusion. Think about what’s in there: juniper berries, angelica root, corriander, cardamum, citrus. Try infusing a lot of these into a small quantity of gin, to make an intense supergin that will hold up to dilution. Or infuse these flavors into the cream. Obviously, leave out the simple syrup. And avoid vodka cocktails (see above. And they’re not real cocktails). If you’re making your own creations, remember that alcohol is a great solvent. Many flavors will infuse into the booze itself more readily than they will into the dairy. And alcohol is great for macerating dried fruits. The best rum raisin ice creams are alwways made with raisins soaked in a portion of the rum. Many of us got our first childhood buzz off of this flavor, and still remember it fondly (or don’t). Go to good cocktail bars. Figure out what the mixologists are doing. The best of these guys are essentially chefs. Notice how they layer and balance the flavors. Notice how in some cases all the individual flavors remain identifiable; in other cases, an entirely new flavor is created by the combinations. Try to figure out what’s going on. Look at the structure of classic cocktails (and the often similar modern ones). Try to accomplish the same effects in the flavors you create. If you haven’t had the pleasure, Grand Marnier is a delicious liqueur made by infusing orange and spices (especially cloves) into cognac. Most other orange liqueurs taste like Kool Aid in comparison. This recipe is based on the standard ice cream base described in a previous post, with the modifications outlined above. I’ve replaced a portion of the trimoline with chestnut honey; this provides some dark, bitter, and savory notes that help support the liqueur’s flavors. Makes 1 liter. Written for an immersion circulator and blender, but should be easily adaptable to other techniques. Optional: 1/4 cup stuff to mix in: candied ginger, candied orange peel, shaved chocolate, white raisisns macerated in a portion of the grand marnier, etc. -measure milk, honey, and invert syrup into blender. -add cream, yolks, Grand Marnier. -cook in water bath for 45 minutes to set custard, hydrate stabilizers, denature milk proteins. -gently agitate bag after 5 and 15 minutes. if you see air accumulated in the bag after 15 minutes, release it, and carefully reseal bag. -spin in the ice cream maker. With a mulitispeed machine, use a slow setting (this recipe works best with a low overrun). Ideal drawing temperature is 23°F / -5°C. -optional: mix in the mix-ins. The Bourbon Smash is one of my favorite summer cocktails. It would be one of my favorite winter cocktails, too, but it can be hard to find fresh mint outside the summer months. I just made a batch of this from the last surviving mint from my garden, which wasn’t in the best shape (there’s an inch of snow on the ground, and the leaves are mostly turning black). Can you come up with a better version for winter? How about less citrus, and replacing the mint with cardamom or cloves? This recipe illustrates a few techniques beyond the basics: zesting a lemon and incorporating zest with the dry ingredients (hint: a fine Microplane is probably the most efficient tool for this); incorporating fresh citrus juice (strain, and add after the cream and eggs have been incorporated, to keep the milk proteins from curdling); and herbal infusion (done at low temperature—important with mint, to protect its delicate flavor) and the addition of essential oil, to compensate for the difficulty of infusing mint’s full flavor. *Use the best quality milk and cream you can get. Avoid anything ultrapasteurized. Low-temperature pasteurized is ideal. Homogenized products will give best texture. Avoid cream with added stabilizer (unknown variables). Dry milk should be 100% skim milk solids, processed without high heat. There should be no off odors either when it’s dry or when it’s mixed. Store sealed in freezer. -measure and combine lemon juice, bourbon, and bitters. set aside. -measure milk and trimoline into blender. -add cream and yolks. blend briefly. -add bourbon-lemon-bitters mixture. briefly blend again. – while mix is cooking, rinse mint leaves and trim off browned parts and most of the stems. -remove bag from water bath. pour mix into clean blender container (or a square container if using a homogenizer or stick blender). -put mint leaves in ziploc bag. -pour mix back into bag. -pour into ice cream maker. Thank you for this Booze Flavor Ice Cream. I will try your recipe. I hope you found the spreadsheet somewhat useful. I really agree with the sentiment that a lot of the delicate ice creams should be less sweet. For alcoholic ice cream, I do pretty much the same thing (more stabilizer and no dextrose) but I also used maltodextrin for the contribution solids in both alcoholic sorbets and ice creams when the liquor is not reduced. It is barely considered sweet and does not affect the freezing point as much which makes it really useful for things like creme de menthe for example or Tia Maria which might have high sugar and alcohol by default. HI Anon, thank you for the ice cream spreadsheet. It looks excellent. I've played with it a bit. My Excel skills aren't great, so I've been putting off editing it to match my own workflow and the way I think about recipes.